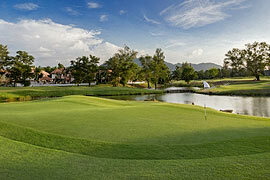 This short par 4 is an excellent starting point for the golf course. Large trees line the right side of the fairway, and long hitters can gamble by cutting the corner. The hole bends from left to right. The straight hitter will be rewarded with an easy approach onto this flat but small green. A drive over the lagoon starts this hole as it follows the natural landscape up a small hill. The green is tucked behind a ridge that runs the entire length of its right side. The safe route on the second shot is down the centre of the fairway between the numerous traps that guard the landing area. Long hitters may opt to carry the coconut grove that hides the green. With the green perched on top of a small ridge, the surrounding mountains provide a dramatic backdrop to this medium length par 3. Many golfers choose to play one club short to avoid the bunkers on the left and back of the green. With water running along the entire left side of the hole, the tee shot is very demanding. The bunker on the right defines the optimum placement, while the two-tiered green makes for an interesting target. This long par 5 is the most difficult on the course. With water close to the left side of the landing area, it is better to keep to the right on the tee shot. Having successfully negotiated that, you must then master an uphill shot into a narrow landing area with bunkers on the right and a coconut grove on the left. The short third shot is also uphill towards the large green. This straightaway par 4 looks easier than it is. A large bunker absorbs the left side of the fairway. Longer hitters can try to play over the bunker; however, a tee shot short of the bunker leaves an open second to this well protected green. Definitely the longest par 3 on the course. Though it plays slightly down hill, this hole requires a masterful long iron shot to land on the green, as it is well protected by bunkers on the left and water on the right. Some say this is the hardest hole on the golf course. With water on the left and three gaping bunkers to the right, a straight tee shot is the key to this long dog-leg right par 4. Once safely on the fairway, a delicate approach is needed to play onto the steep, sloping green. At 373 야드, the ninth hole is a relatively short par 4. A tee shot is needed down the centre of the fairway as any to the right side make for a longer second shot However the approach shot must be accurate as it has to be played to a small island green that slopes off to the water. This hole is recognized as one of the course's signature holes and is featured in many promotional photographs. Disclaimer @ Copyright 2003-2019 Phuket Travel Co., Ltd. All rights reserved.